Luang Por Klaew, was a Gaeji Ajarn of the Supannburi Province, born in 2453 BE. and passed away in the year 2528 BE, leaving the temple to his successor Luang Por Pra Kroo Suparatanogas. He ordained at a young age and inherited his famous Wicha from his Kroo Ba Ajarn, Luang Por Lek, the previous Abbot of Wat Wang Hin. Luang Por Klaew, was extremely famous for being able to perform anti black magic, and fireproof spells, and for his ability to banish ghosts and demons. His power of Klaew Klaad, was legendary, and synonimous with his name 'Klaew'. Luang Por Klaew was a close accomplice of the Great Luang Por Mui, of Wat Don Rai. His 'Rian Kanajarn' Monk Coins, Takrut, Pha Yant and Somdej amulets are all highly revered for their power to protect and to increase auspicious fortunes and prosperity. 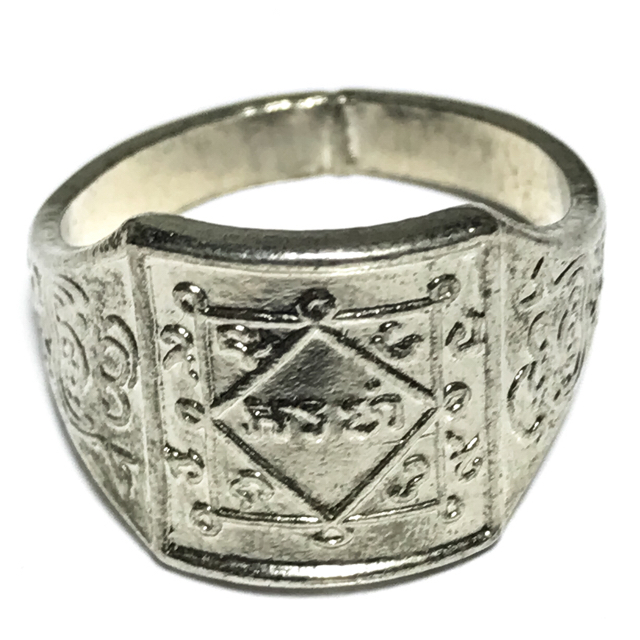 The front face of the ring has an eight knots Yantra composed of two square Yant, with the Kata 'Arahang' in Khom Pali Agkhara lettering embossed. The sides of the ring have Sacred Yant on them with Unalome. The inner side of the ring has a Yant Putsoorn concentric Dhyani Buddha Yantra engraved upon the surface as the 'Yant Pratab Hlang' rear face shield of protection. The Hwaen Arahang is renowned for its Klaew Klaad, Anti Black Magic/Curses, and Serm Duang Karma Improvement Powers. It is also a highly recommendable amulet for those who are serious practitioners of the eightfold path, to contemplate the Mantra ('Arahang' - Enlightened One), as a mental anchor for mindfulness of the Buddha's Enlightenment, and the practice of the 8-Fold Path (Buddhanussati + Bhavana). The below version is called I Dti Bpi So Paed Tidt (8 directional chant) – if you read it vertically top to bottom and each column left to right, you will see it reads I Dti Bpi So. If you read it Horizontally left to right top to bottom, then it reads the same as Yant Gratuu Jed(7) Baeg.